The CCMIL (Caked Crusader’s Mother in Law) has a birthday only two days after mine. 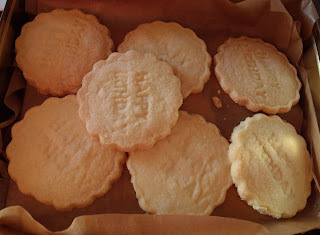 As she has to be careful about her sugar intake I decided against a cake and, knowing her fondness for a ‘plain’ biscuit, decided on birthday biscuits. This is such a simple recipe yet the results are amazing. 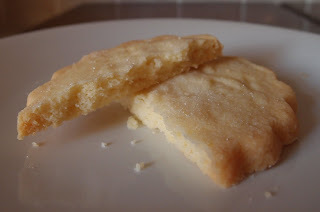 I know some people think shortbread can only be called shortbread if it contains rice flour or similar to “rough” the texture up, but I think this recipe produces a wonderful, buttery, crisp yet crumbly biccie. And surely that’s what we all want? 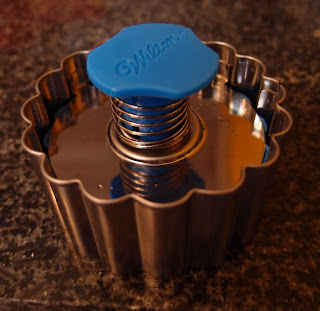 It was a first outing for my Wilton biscuit cutter and stamp. The ‘happy birthday’ message just about survived baking! I think it would work better on a less buttery biscuit that would hold its definition more on baking – I did try chilling the biscuits before baking to hold the shape more, but it made no difference at all. This is the type of recipe that works as a standalone biscuit to enjoy with a cup of tea, but would also be a fab accompaniment to a mousse or pannacotta for dessert. You could flavour the biscuit with any extract or alcohol and you could also add dried fruit or chocolate chips. Just think how yummy it would be with dried cranberries for Christmas. 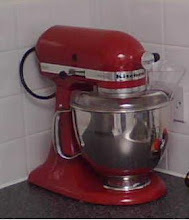 It only takes a few minutes to make the dough so is a good recipe to have in your armoury! Beat together the butter and sugar until you have a smooth paste. Stir in the flour and bring together to a dough. Roll out the dough between two sheets of clingfilm. You’re aiming for a thickness of approximately 1cm. Cut into rounds and place on the baking tray; allow a little room for expansion but no need to leave more than about 1cm. NB. The dough re-rolls easily so don’t waste any of it! Sprinkle with additional caster sugar. Bake for approximately 15 minutes or until the biscuits are golden brown. Mine took nearer 18 minutes. Store in an airtight container – they will keep for days and days! I discovered the joy of stamping biscuits recently and not sure I'll ever make them any other way again! These look like a lovely birthday treat - so pretty and simple. 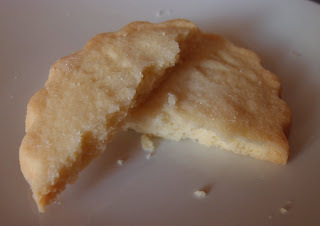 I have been making loads of shortbread recently - they are so additive, both to make and to eat! They look brilliant! The stamp is so sweet! Oooh, yum. Sometimes simple is best (sometimes, your amazing pineapple creation is best!). I love that cookie cutter too. Hope the MIL liked them. Those are so cute!! I need that cookie stamp. Love the cookie stamp! Must look out for it. Thanks for yet another brilliant recipe. The cookies look really soft, buttery and crumbly. Yum, I love a crumbly, buttery shortbread. A lovely, and probably more manageable, alternative to a massive cake. I love the stamp!!!!!!! 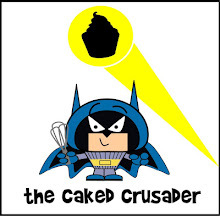 The Caked Crusader is obviously a wonderful daughter-in-law. Shortbread is so wonderful and fun to make; every time I make it, my friends act as if I've just invented the wheel. I don't understand this, but I try to nod and smile modestly. I'm sure these were received with the same delight. 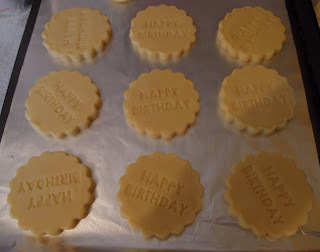 Who doesn't love shortbread - lovely idea for a birthday especially as stamped by you. 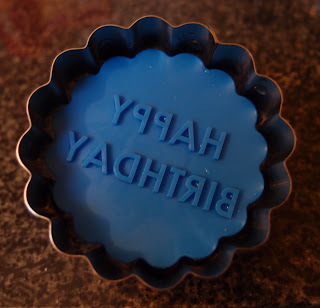 I'm still trying to get to grips with my "home made" stamper but haven't yet found a biscuit that holds the definition well. I love your stamper, so cute! Biscuits look lush too, love shortbread mmm so buttery and good! Love this shortbread:) look deliicous! Lovely! I love the stamp! I always do my shrotbread 1:2:3 sugar, butter, flour! Will try with your adjustment. I love the Happy Birthday stamp. Shortbread is addictive it's so buttery.